of lacrosse in Maryland. The league is highly competitive and well organized. Girls Lacrosse is significantly different than Boys Lacrosse, with the primary difference being the lack of body checking. In fact, contact is not allowed except for very specific cases so this explains why the girls do not suit up in pads and helmets, except for the goaltender. 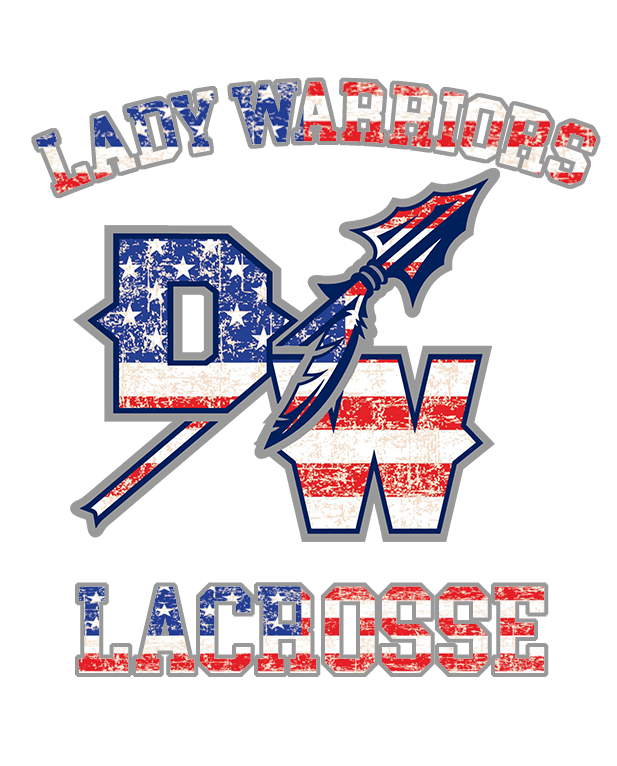 All Dunkirk Warriors Lacrosse programs are open to players of any skill level, including beginners. First day of practice begins March 1st. Games for the Pee Wee, Middie, and Junior teams begin the first week in April. Sticklettes will begin their games in late April. The teams participate in various pre-season and post-season tournaments. Varsity Girls Lacrosse games during the half time. Women’s LAX regulation lacrosse stick. Very expensive sticks are designed for powerful, experienced players. If your daughter is K-8, it is not necessary to buy a top-of-the-line stick. By the time they grow into the capability of that stick, there will be better technology out there! A stick in the range of $50 is sufficient for the beginner to intermediate player. The following programs divide players and teams evenly. All players in uniform shall play a minimum of 50% of each game. Exceptions made when squad is so large to make this mathematically impossible or in cases of injury or disciplinary action. The Sticklettes program is focused on fun and instruction. Teams play a 6 vs. 6 format on a half sized field with no goalie and no checking. Pass rule applies. Games are officiated by coaches. The Pee Wee program continues to emphasize basic skills and instruction while introducing some basic plays. Teams play an 8 vs. 8 format on a half sized field with a goalie; no checking. Minimum pass rule applies. The Middie program continues to emphasize fundamentals and introduces more plays and strategy. The Middie program includes an end of season single elimination playoff for top seaded teams. The Junior program introduces more advanced techniques are introduced while continuing to work on skills, key plays and strategies. The JUNIOR program includes an end of season single elimination playoff for top seaded teams. The levels may fill completely before the end of the registration period, and therefore close early. So don't miss out, register now! Players cannot play down, but they can play up. Where can I buy my equipment? What days do we practice? Pee Wee, Middie & Junior Teams generally practice two-three days a week. Sticklettes practice once or twice a week. Coaches will determine what days you will practice. For Pee Wee, Middie, and Junior teams practices will start the first week of March. For Sticklettes, practices start the middle/late of March. For Pee Wee, Middie, and Junior teams, games start the last week of March or the first week of April. The county typically posts game schedules the week prior to games beginning. For Sticklette teams, games start the end of April or early May.